Most people want a faster site, but without the metrics to prove how it affects the bottom line, those projects fall by the wayside. The fact is, if your website takes longer than 3 seconds to load, it's already losing revenue. And that’s just one of the many proof points that have been published by Amazon, Google, and others in recent years. 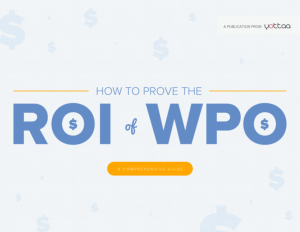 Simply put, speeding up page load times through web performance optimization (WPO) is the most efficient way to increase the ROI of your website. In the guide you’ll also find a breakdown of manual vs. automated web performance optimization and a Free Web Performance ROI Calculator for custom analysis. Download the free guide now!